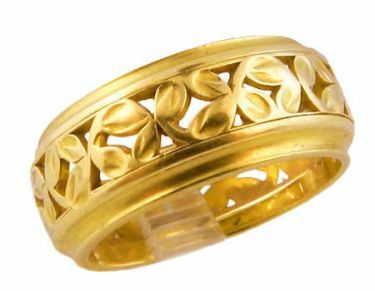 Description: A vintage 14k yellow gold 8.0mm wide wedding band that has a continuous 3 leaf clover pattern. 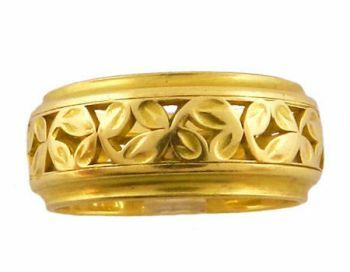 The hand pierced and detailed foliage work is pressed between two gold bands. The three Leaf Clover symbolizes domestic virtue and fertility in some cultures, in others it represents the holy Trinity. Which ever meaning you choose both are meaningful symbolisms for a wedding band. Weighs 4.7 grams. Stamped 14k WOOD. Vintage but actual age unknown. 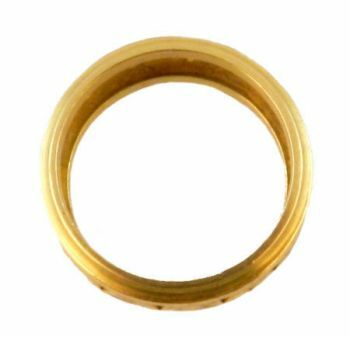 Measurements: Measures 8.0mm in width by 1.8mm in height/depth. Size 6 1/2. Band not re-sizable.